In 2018, the NIH funded or renewed funding for three programs that provide specialized training for graduate students in biomedical engineering. Two of these training programs are offered jointly through Purdue University and the Indiana University School of Medicine. The programs leverage the combined strength and excellence of two nationally top-ranked schools with state-of-the-art facilities and resources, multidisciplinary centers, and institutes focused on global health and impact. The five-year grants enable the schools to expand their educational and research alliances in three elite training programs: Medical Scientist Training Program, Bioengineering Interdisciplinary Training in Diabetes Research, and the new Interdisciplinary Training Program in Auditory Neuroscience. 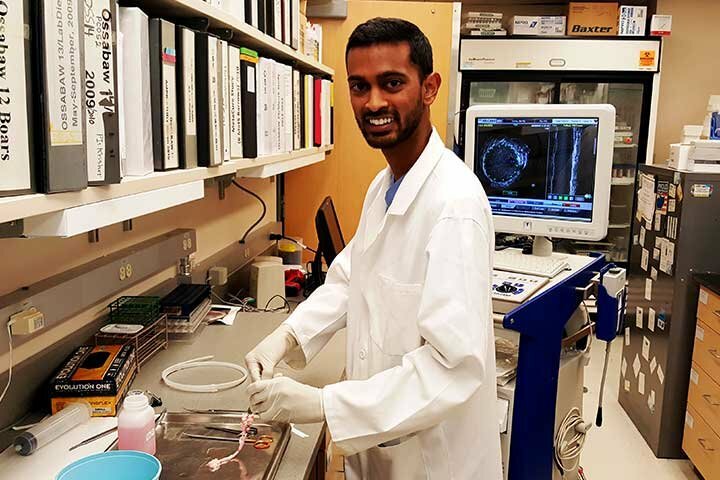 "Being a physician-engineer means being at the crossroads of technological innovation and clinical medicine, and ultimately having knowledge in both to see engineering discoveries translate into practical solutions in the hospital.” –Ayeeshik Kole, an MD-PhD candidate in the Medical Scientist Training Program, a joint venture of Indiana University School of Medicine and Weldon School of Biomedical Engineering at Purdue. A joint venture of Indiana University School of Medicine (IUSM) and Weldon School of Biomedical Engineering at Purdue, the Medical Scientist Training Program is a combined degree program (MD and PhD BME) that integrates innovative biomedical engineering research with exceptional clinical medical training. A highly selective program, the Medical Scientist Training Program provides strong mentorship, an incredible breadth of research opportunities and a unique curriculum to help learners gain insights for the translation of innovative medical research. From research into the molecular pathogenesis of disease to the physics of advanced medical imaging, the goal of this training program is developing novel therapies through strong clinical acumen and expertise in engineering and the basic sciences. The Bioengineering Interdisciplinary Training for Diabetes Research (BTDR) program is a training program that advances the prevention and treatment of diabetes through innovative devices, therapeutics, and technologies as well as a cadre of future scientists who can translate research to clinical care. The program is a joint venture of the Weldon School of Biomedical Engineering and College of Veterinary Medicine at Purdue and IUSM. The program provides cross-disciplinary, integrated research training to develop pre-doctoral students into bioengineers capable of leading integrative and team-based approaches to address needs and problems associated with diabetes and metabolic diseases. A new therapy is in a clinical stage of testing to reverse Type 1 diabetes in dogs, such as for 7-year-old Lexi, pictured next to her owner, Jan Goetz. The therapy was developed through a NIH T32 training grant, the Bioengineering Interdisciplinary Training for Diabetes Research, which was renewed in 2018. This year, the National Institute on Deafness and Other Communication Disorders (NIDCD) awarded a grant to Purdue through the NIH’s flagship training program, the Ruth L. Kirschstein National Research Service Award Institutional Research Training Grant. The grant funded the Interdisciplinary Training Program in Auditory Neuroscience (TPAN) at the intersection of auditory neuroscience and innovative technologies, such as neuroimaging, stimulation devices, electrophysiology and mathematical modeling. The program is preparing students for independent research that advances understanding of auditory system function and develops solutions, devices, and strategies to assist and prevent hearing loss in human patients. Difficulty understanding speech in background noise is the most common hearing complaint. Vibha Viswanthan, a Weldon School PhD student affiliated with TPAN, recently received a three-year Research Fellowship Award (F-31) from the NIDCD. The focus of her study is to systematically track the representation of noisy speech from the inner ear to the brain, and determine how this internal representation relates to speech intelligibility in individual human listeners. Ultimately, this work will aid the development of hearing aids, cochlear implants and aural rehabilitation strategies. 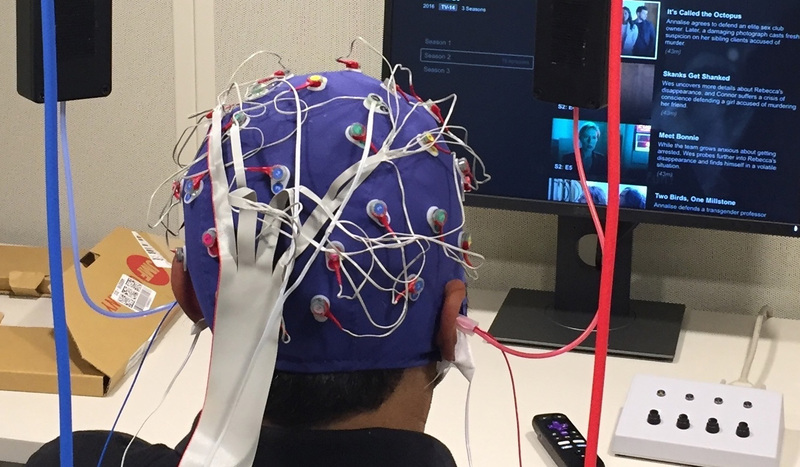 A subject participates in a study to measure responses to sound from the auditory nerve to the brain stem. These three training programs will increase research and educational synergies between faculty, students, and clinicians on the Purdue and IUSM campuses and industry partners in Indiana and around the world.